With the completion of the 2006 draft final Conservation Management Plan for the precinct [see earlier post], further extensive comment was received from the Civic Square stakeholders, however incorporation of this additional comment and information into the draft final Plan was not feasible within the project’s resources. 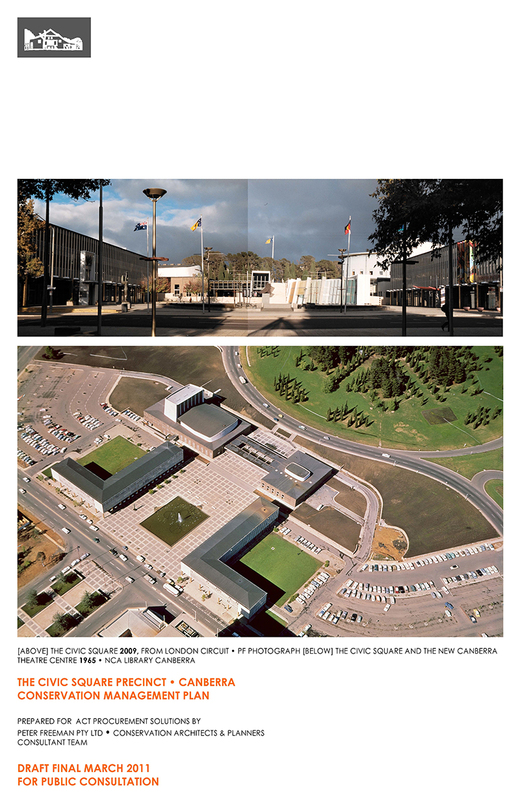 However, late in 2008, in recognition of the forthcoming Canberra Centennial celebrations , the Cultural Facilities Corporation [CFC] and ACT Procurement Solutions gathered funding sufficient to allow the finalisation of the Civic Square precinct CMP. The broader stakeholders comprised the ACT community; the ACT Legislative Assembly [ACT LA]; the ACT Heritage Council [ACT HC] and ACT Heritage Unit; the ACT Planning and Land Authority [ACTPLA]; the National Capital Authority [NCA]; the ACT Chief Minister’s Department [ACT CMD]; and [latterly] the ACT Department of Land and Property Services. As a preamble to the [2009-2010] finalisation of the Civic Square precinct CMP an overview summary of the current status of the Plan was prepared for the stakeholders. This overview included a review of the current status of the draft final Conservation Management Plan; a review of the current heritage recognition of the Civic Square precinct; a review of the current and potential heritage initiatives related to the Plan; and the current ACT Heritage Register listing for the precinct, and a review of the current and potential planning initiatives both within and beyond the precinct. Thus this  final Plan, prepared for the purposes of public consultation, is the product of six years work, and there have been a variety of iterations within that period.